Finding educational activities for children can be tough. And finding something that’s fun and educational can be an even bigger challenge. 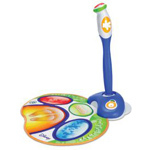 Leapfrog delivers both with a new, interactive toy (though they like to refer to it as a Learning System) called the Zippity. 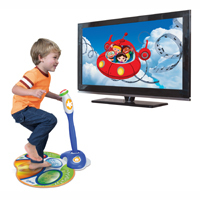 Kind of like a Nintendo Wii Fit for the preschool set, the Zippity lets children play games using motion. It is comprised of a colorful, foldable mat with an attached life-sized joystick, plus a console that plugs directly into the TV. The mat and the console talk to each other wirelessly, so there are no extra wires trailing through your living room, and it’s super easy to set-up. Using it seems fairly easy—as it should be for little kids just getting used to hand-eye coordination (the suggested age range is for kids 3-5). Just choose a game and watch your child run, jump, dance and march. While moving, your child will use the joystick to move onscreen characters left, right, forward and backward. It’s co-developed by Disney and Leapfrog, so the included content is based on Playhouse Disney characters and programming—such as Mickey Mouse, Winnie the Pooh, Handy Manny and Little Einsteins. Activities include solving mysteries in the Hundred Acre Wood or building words with Handy Manny’s crew. For $80, it comes with eight built-in games, each of which has two levels of play based on skills like word recognition, memorization, music and art, and problem-solving. Other games available now for Zippity are Cars and Disney Princess, though more will be coming out this fall. Each new piece of software will run $25. If you sign up for information regarding the Zippity you’ll get $5 off your purchase and if you buy a system from Leapfrog.com now, you’ll get free shipping as well.